From buzzing cities to vast wildernesses, Ontario has an answer for every craving. 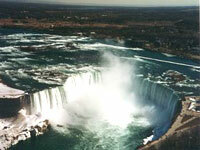 High-energy adventure and the tranquillity of nature await visitors to Canada's most populous province. Located in the central part of the country, Ontario is home to Canada's capital, Ottawa, and its largest city, Toronto. Travellers flock to Toronto for a taste of its world-class attractions, entertainment, shopping and restaurants. The city has also become a cultural hub on the international stage, thanks in part to the influence of nearby Montreal and New York. Vibrant multicultural neighbourhoods have given Toronto a cosmopolitan edge, though not at the expense of its signature politeness. Ottawa and Toronto are in the southeastern corner of the province, around the massive lake Ontario. The north is bear country and largely uninhabited. The rest of the province is scenic, nature-filled, and just a few hours' drive outside of Toronto. The awesome Niagara Falls and legendary Great Lakes of North America make this region a nature-lover's dream destination. Canoeing, swimming and diving are popular activities, while the province's sprawling forests make it a priority stop for hikers.